I have seen this piece often but seeing it again after a long break it seems just as fresh and shocking as the first time I saw it. An owl with flight in its being but condemned to walk with those vulnerable feet. It has presented itself for scrutiny, having climbed the steps of its platform. (An aberration of nature. Would it rather be hiding in the cave-like enclosure below?) There is dignity in its bearing and self-defense in its heel-claws and beak. But its eyes – an owl's most striking feature – are muted/blind/blank. Its crucial wings are gone, a shroud-like form replacing them. This piece makes me think of our imperfect world. We want to fulfill all that is in us: to soar, to see, to dream, but our condition is such that our potential is subdued and transmogrified into something else. Owl also made me think of the biblical Samson. Such potential for good was in him, but his life ended with impairment and blindness, an aberration compared to what he might have been. Yet his final conquering act flowed out of a humiliating presentation before the Philistine elite. Perhaps we have been humiliated, our wings have been clipped and flight is no longer an option – yet we must keep using our feet. For most South Africans the apartheid era was one of unrelenting dusk. Hope was a fragile commodity. Paradoxically the anthem of liberation was one of great hope: ‘Nkosi sikelel' iAfrika’ (Nkosi is the Zulu word for King or Chief and for God), a Christian hymn calling for God to bless Africa amidst the pain and struggle. Fragile hope amidst terrible pain, it is powerfully evoked in Gert's Nkosi. The young vulnerable bird is wearied and almost overwhelmed by the obstacles to its normal growth and development. The pathos is tangible. The head is bowed beneath the weight of the struggle and yet it is slightly turned upwards as if to refuse to relinquish the possibility of redemption. Few works capture so integrally the terrible juxtaposition of pain and hope in human (note the hands) experience. Extract from Gert Swart's 1997 Tatham Gallery exhibition catalogue 'Contemplation'. 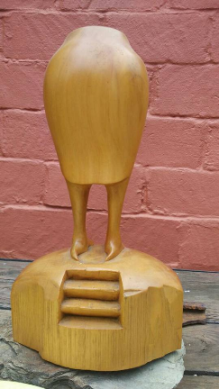 Gert Swart: Owl, 1997, bronze, 28 x 16 x 14 cm, edition of 9 in public and private collections, and the original yellowwood carving. 1997. 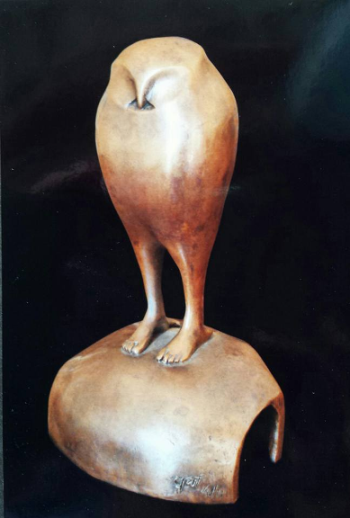 Gert Swart: Nkosi, 1989, bronze, 13 x 11 x 17 cm, edition of 12: in various private collections. Gert Swart was born in 1952 in Durban, Natal, South Africa. He has worked as a sculptor in Pietermaritzburg, South Africa, for the past 28 years. See his work on http://gertswartsculptor.homestead.com. Walter Hayn is an artist working in London, UK and part-time school Art Teacher. He is co-leading Ichthus Forest Hill Art Forum (an artist support group). He is originally from Durban, South Africa, where his acquaintance and friendship with Gert Swart and Craig Bartholomew began 28 years ago. Craig Bartholomew is the Director of the Kirby Laing Institute for Christian Ethics, Cambridge, England. Formerly he was Senior Research Fellow at the University of Gloucestershire and recently the H Evan Runner Professor of Philosophy and Professor of Religion and Theology at Redeemer University College in Ancaster, Canada. Currently he is Senior Research Fellow at Tyndale House, Cambridge, UK.